Surface layer plastic deformation as a mechanism for UHMWPE wear, and its role in debris size. Ultra-high molecular weight polyethylene (UHMWPE) remains the primary bearing material for use in artificial joints, but the longevity of these implants is still hindered by an osteolytic immune system response initiated by sub-micron sized wear debris released from the UHMWPE bulk component. Studies have shown that the severity of the immune system response is linked to particle size. Current treatments for reducing this effect focus on reducing the total volume of wear, but do not directly address particle size due to a limited understanding of the mechanisms involved in producing such small debris. Directly observing these mechanisms is inherently challenging, but indirect methods, such as debris characterization and wear surface analysis, suggest that multiple mechanisms are present throughout a wear process, including a poorly understood plastic deformation process. In this study, finite element models exhibited areas of plastic deformation that were of the same size scale as the relevant debris, and novel experimental techniques were used to verify these regions of deformation. Using this insight, equations based on surface buckling were derived that accurately describe the characteristic rippling formations found on the surface of the UHMWPE bulk. This information can be used to influence the size and shape of submicron wear debris. This is a manuscript of an article published as Plumlee, K. G., and C. J. Schwartz. 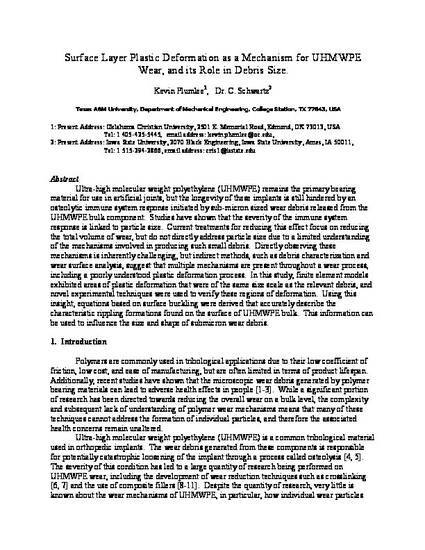 "Surface layer plastic deformation as a mechanism for UHMWPE wear, and its role in debris size." Wear 301, no. 1-2 (2013): 257-263. DOI: 10.1016/j.wear.2012.11.081. Posted with permission.